The migration of applications to cloud computing must be done in a strategic and methodical manner. Existing enterprise applications must be thoroughly assessed to determine which workloads can benefit most from early migration to the cloud. Key considerations including costs of migration, application redesign, application performance and availability, security and privacy requirements, and regulatory requirements must be taken into account. 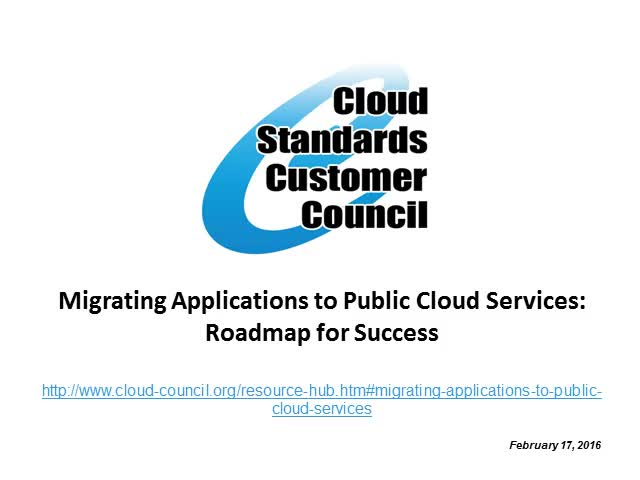 The aim of this presentation from the Cloud Standards Customer Council is to provide a practical reference to help enterprise IT and business decision makers analyze and consider application migration to cloud computing. The presentation focuses primarily on the migration of applications to public cloud services. It includes a list of steps, along with guidance and strategies, that takes into consideration both business and technical requirements. This presentation is intended for members of the Cloud Standards Customer Council™ (CSCC™) and will explain the transition of the CSCC to the newly formed OMG® Cloud Working Group in July 2018. The Object Management Group® (OMG®) is an IT standards development organization headquartered in Needham, MA, USA with a longstanding history (nearly 30 years!) of supporting software standards and communities of practice. The OMG launched the Cloud Standards Customer Council in 2011 to serve as a source of vendor-neutral guidance on cloud computing best practices, standards and opportunities for standardization. Contributing members of the CSCC published 28 whitepapers and reference architectures to highlight customer requirements and advance the successful adoption of cloud computing. The OMG is transitioning this program to a Cloud Working Group. The Cloud Working Group will maintain and update the deliverables published by the CSCC over the course of 2011-2018, and initiate new projects under the OMG Cloud Working Group umbrella. The Cloud Standards Customer Council has published a new whitepaper, Best Practices for Developing and Growing a Cloud-Enabled Workforce. Cloud Foundry from the Linux Foundation is a collection of complementary open source technologies focused on application developers and operators, as well as many projects to support and extend them. In this webinar on April 24th, Chip Childers will provide an overview of Cloud Foundry technologies (Application Runtime, Container Runtime and BOSH) discussing use cases and core project updates. He will discuss the technical benefits of the platform, focus areas for 2018, and major highlights from the Cloud Foundry Summit, April 18-20 in Boston, MA. As organizations consider migrating applications to the cloud, a business plan and detailed migration plan is critical to success. Version 2.0 covers the key considerations of cloud migration and takes into account the increasing diversity of approaches such as the use of containers, virtual machines and serverless functions, as well as the increasing use of hybrid cloud solutions. In addition, mitigating concerns related to security, privacy and data residency is a major focus of the update. With the rise of managed IT services and cloud computing, sensitive data is regularly moved across countries and jurisdictions, which can be in direct conflict with various international, national or local regulations dictating where certain types of data can be stored (e.g., the European Union’ General Data Protection Regulation, or GDPR). Data residency is also a consideration of data owners responsible for protecting and securing data from unintended access. The Object Management Group® (OMG®), a technology standards consortium, launched a working group in 2015 to address the challenges of data residency and define a standards roadmap to help stakeholders manage the location of their data and metadata. Given the complexity of the issue, a stepwise improvement plan is necessary. This webinar will introduce a new Data Residency Maturity Model (DRMM) proposed in December 2017. Similar to the Capability Maturity Model (CMM) invented in 1990 at the Software Engineering Institute (SEI), the DRMM contains five maturity levels aimed at helping an organization improve their practices and governance of data residency. The OMG seeks feedback on the DRMM and calls on all interested parties to contribute to this work. Hyperledger is an umbrella open source project started in December 2015 by the Linux Foundation to support the collaborative development of blockchain-based distributed ledgers across industries. A blockchain is a continuously growing list of records, called blocks, that are linked and secured using cryptography. Transactions between two parties are recorded efficiently and in a verifiable and permanent way. In this webinar, Dan O’Prey and Tracy Kuhrt will present an update on the blockchain market, industry trends, and new Hyperledger projects. They will discuss the technical items delivered over the last 6 months and focus areas for Hyperledger in 2018. Version 2.0 of Interoperability and Portability for Cloud Computing: A Guide is now available. This paper from the Cloud Standards Customer Council provides a clear definition of interoperability and portability and how these concepts relate to different components in the architecture of cloud computing, each of which needs to be considered in its own right. Version 2.0 reflects the new ISO/IEC 19941 Cloud Computing Interoperability and Portability standard and its facet models of interoperability, data portability, and application portability. In this webinar, authors of the paper will discuss how to select and provision cloud services indicating how interoperability and portability affect the cost, security and risk involved. Version 3.0 of Security for Cloud Computing: Ten Steps to Ensure Success has just been released for publication. As organizations consider a move to cloud computing, it is important to weigh the potential security benefits and risks involved and set realistic expectations with cloud service providers. The aim of this guide to help enterprise information technology (IT) and business decision makers analyze the security implications of cloud computing on their business. The Practical Guide to Cloud Computing is the CSCC’s seminal deliverable outlining key definitions, characteristics, and benefits of cloud computing. The heart of the guide is a comprehensive 10-step “Roadmap for Cloud Computing” containing guidance and strategies for the successful migration and deployment of cloud computing applications. In this webinar, the authors will review each of the 10 steps in the guide and highlight the technical changes made to this latest version including the emergence of hybrid cloud, containers, serverless computing and microservices architectures. For cloud computing, interoperability and portability related challenges are likely to intensify and become more difficult to manage as systems grow more complex and interconnected, especially with the use of multiple cloud services as part of a system. In this webinar, the Cloud Standards Customer Council will receive an update on a new ISO Cloud Computing Interoperability and Portability specification - ISO/IEC 19941. This new ISO standard specifies cloud computing interoperability and portability types and the relationship and interactions between these two cross-cutting aspects of cloud computing. It also provides a model to enable a clear description of interoperability and portability when building and using systems based on cloud computing. Attending this webinar is beneficial for all parties involved in cloud computing – cloud service customers, cloud service providers, and cloud service partners – to gain a common understanding of interoperability and portability for their specific needs. Today, the majority of big data and analytics use cases are built on hybrid cloud infrastructure. A hybrid cloud is a combination of on-premises and local cloud resources integrated with one or more dedicated cloud(s) and one or more public cloud(s). Hybrid cloud computing has matured to support data security and privacy requirements as well as increased scalability and computational power needed for big data and analytics solutions. This webinar summarizes what hybrid cloud is, explains why it is important in the context of big data and analytics, and discusses implementation considerations unique to hybrid cloud computing. The CSCC has published version 2.0 of Cloud Customer Architecture for Big Data & Analytics – a reference architecture that describes elements and components needed to support big data and analytics solutions using cloud computing. Version 2.0 of the architecture includes support for new use cases and cognitive computing. Big data analytics (BDA) and cloud computing are a top priority for CIOs. As cloud computing and big data technologies converge, they offer a cost-effective delivery model for cloud-based analytics. Many companies are experimenting with different cloud configurations to understand and refine requirements for their big data analytics solutions. Cloud Management Platforms (CMPs) are integrated products that provide for the management of public, private and hybrid cloud environments. The rise of hybrid IT architectures increases the need for process harmonization and tools interoperability to address evolving requirements through the use of a CMP. Blockchain technology has the potential to have a major impact on how institutions process transactions and conduct business. At its core, blockchain features an immutable distributed ledger and a decentralized network that is cryptographically secured. A blockchain is a historical record of all the transactions that have taken place in the network since the beginning of the blockchain and serves as a single source of truth for the network. Attend this webinar to learn about the capabilities of a Blockchain cloud reference architecture including deployment considerations and specific application examples. The Internet of Things (IoT) is one of the most exciting and dynamic areas of IT at the present time. IoT involves the linking of physical entities (“things”) with IT systems that derive information about or from those things which can be used to drive a wide variety of applications and services. IoT covers a very wide spectrum of applications, spanning enterprises, governments and consumers and represents the integration of systems from traditionally different communities: Information Technology and Operational Technology. As a result, it is important for IoT systems to have architectures, systems principles, and operations that can accommodate the interesting scale, safety, reliability, and privacy requirements. Attend this webinar to hear best practices for supporting the Internet of Things (IoT) using cloud computing. Introduced in 2004, the Data Distribution Service has developed into a mature and proven connectivity standard within the IIoT. Today, DDS is at the heart of a large number of mission- and business-critical systems such as, Air Traffic Control and Management, Train Control Systems, Energy Production Systems, Medical Devices, Autonomous Vehicles, and Smart Cities. Considering the technological trends towards data-centricity and the rate of adoption, tomorrow, DDS will be at the heart of an incredible number of Industrial IoT (IIoT) systems. To help you become an expert in DDS and expand your skills in the growing DDS market, Object Management Group is offering this DDS Technical Overview webinar series covering three key areas: (1) the essence of DDS and data-centric systems, (2) how to effectively exploit DDS Quality of Service to build applications that perform and scale, and (3) securing your distributed DDS system. Part I of the OMG DDS Webinar Series will get you started with DDS. We will (1) cover in great details DDS’ key abstractions, (2) introduce the essence of DDS-based data-centric and modular architectures, and (3) clearly position DDS with respect to messaging technologies. After attending this webcast you will know the fundamentals required to start using DDS in your next project. Presented by Angelo Corsaro, Ph.D., CTO at ADLINK Technology and Co-Chair of the OMG's DDS Special Interest Group. In this webinar, Dan O'Prey, CMO at Digital Asset and Chair of the Hyperledger Marketing Committee, and IBM’s Chris Ferris, chair of the Hyperledger Technical Steering Committee, will provide an overview of the Hyperledger Project. They will discuss the basics of distributed ledger technologies, business use cases for blockchain, and how to get involved with Hyperledger projects. As data is increasingly accessed and shared across geographic boundaries, a growing web of conflicting laws and regulations dictate where data can be transferred, stored, and shared, and how it is protected. The Object Management Group® (OMG®) and the Cloud Standards Customer Council (CSCC) recently completed a significant effort to analyze and document the challenges posed by data residency. The Cloud Standards Customer Council™ is an end user advocacy group dedicated to accelerating cloud's successful adoption. Join the CSCC™ to discover best practices and to learn about cloud standards and open source initiatives within one organization.